Positioned in the very heart of the Mediterranean is a world-class resort. Capturing the magic and mystery of the Mediterranean Sea, the Corinthia Hotel St. George’s Bay is what dreams are made of. The astounding views of the sea, as seen from the grand windows in the lobby and vast majority of rooms, together with the scent of summer breezes, bring a sense of openness to the travelling spirit. Five-star amenities, a fantastic selection of restaurants with a focus on Mediterranean cuisine and its close proximity to the centre of Malta’s vibrant nightlife, make the hotel a perfect destination for an animated stay. Every room has a generous terrace where you can relax, unwind and enjoy beautiful views. Or have dinner by the pool to the sound of lapping waves. Welcome to an exceptional world of hospitality. The hotel also incorporates a variety of cafes, bars and restaurants. Grill3301 at the Corinthia Beach Resort, has a charming, warm ambience and stunning views of St George's bay. It’s the place to relax and enjoy beautiful seafood or a steak with a bottle of wine. The Grill has ample parking and is open for dinner from Tuesday to Saturday from 19.00 – 23.00 hrs. Henry J Beans is the all-American bar and grill famous for well-made drinks, cocktails, and delicious food served from the open grill. Our menu focuses on our open grill where our chefs prepare a great selection of burgers, sandwiches, steaks and salads. All major sporting events are shown live on the big screens within the venue. We also cater for Hen and Bachelor celebrations, birthday and other special occasions. Open daily from noon till late. The Corinthia Hotel St George’s Bay. A destination that dreams are made of. IInspired by the pulse and passion of a city centre hotel, The Palace is a stylish Deluxe five star Boutique Hotel of distinctive elegance in the heart of Sliema Malta. We offer a variety of accommodation to suit your requirements, from Comfort Rooms to Designer Suites. The Palace and Palazzo Capua, are supplemented with unique Designer Suites combined with the highest quality and comfort to cosset you in luxury. Enjoy our selection of three chic and exclusive restaurants, Tabloid, Talk of Town and TemptAsian Restaurant and Lounge Bar. Adjacent to The Palace stands a 200 year old Palace recently restored to its former glory. Nowadays it’s an exclusive venue for meetings and events. Palazzo Capua accommodates 5 luxurious duplex themed suites. Set in beautifully landscaped gardens of a 19th century restored villa, this elegant hotel offers superior service and amenities, making it one of the leading five-star hotels in Malta. Spend a day being pampered and nurtured in the Athenaeum Spa, with over 50 different treatments to relax the mind and body, or lounge by the outdoor pool while enjoying a light lunch at the open air terrace restaurant. Across the road from the Presidential Palace and botanical gardens, this centrally located hotel is also in close proximity to the capital city, Valletta and the ancient walled city, Mdina. With warm, welcoming staff to greet you and excellent restaurants to dine in, your visit, whether for work or leisure, will be met by unrivalled tranquility. The Caprice Lounge is perfect for unwinding after a long day. The Lounge leads on to the lovely Caprice Wine Garden, a more contemporary-styled al fresco terrace wine bar offering an extensive wine list and cocktail menu. Join us for our Happy Hour every day from 18.00 – 19.00 hrs. The Rickshaw Far Eastern Restaurant not only offers an Oriental-inspired ambiance and atmosphere, but also excels in its pioneering, Asian-Fusion cuisine. Its scrumptious menu features dishes from Thailand to India, Nepal, China, Japan, Singapore and beyond. Following its success here, it has seen the Rickshaw ‘brand’ being extended to other Corinthia Hotels, including the Corinthia Hotel Prague, and the Corinthia Hotel Budapest. Villa Corinthia Restaurant is the epitome of elegance. Set in the 100-year old restored villa, its splendid decor and its superior standards of service and cuisine bare the hallmark of excellence. It is one of Malta`s favourite restaurants, both for family gatherings and business entertainment. The elegant venue is also ideally suited to groups and for special occasions. The Xara Palace Hotel is a unique 17th-century palace hidden away in the medieval fortified city of Mdina, the old capital of Malta. Perched on centuries-old bastions, surrounded by stunning baroque architecture, The Xara Palace Relais & Châteaux, with its luxurious accommodation and award-winning haute cuisine, is truly a haven in which to pause and be pampered. Meticulously and sensitively restored to reflect its former noble standing, the exclusive 5-Star boutique hotel boasts seventeen luxury rooms and suites enjoying stunning views, all individually and tastefully designed with antique furniture and paintings, luxurious Parisian fabrics and king size beds. Our promise to our guests centres on an impeccable attention to detail - from the décor to the serene, unhurried pace of life at The Xara Palace Hotel, through every facet of our service - all setting the scene for nothing less than an exquisitely unforgettable holiday in Malta. Le Méridien St Julians Hotel & Spa, situated on the seafront of the picturesque Bay of Balluta is a 5 star hotel that combines the charm of a boutique hotel and the relaxing feel of a Spa resort. The hotel presents a contemporary design offering ultra-attentive service and comfort. Le Méridien St Julians Hotel & Spa is located across the promenade that stretches to the centre of St Julian’s, a mecca for restaurants, cafes, bars, clubs and the main shopping area of Sliema. The location of the hotel also offers easy access to many touristic and cultural sites. Boasting 276 well-appointed rooms and suites with balconies, Le Méridien St Julians Hotel & Spa offers spectacular sea views and surprising country views over typical Mediterranean terraced fields. All rooms have a separate bath and WC, a separate rain shower cubicle, an iron and ironing board, a laptop safe and high-speed Internet access (free or at a charge depending on the selected room type). Executive rooms are available over three floors with the use of the exclusive Lounge and terrace overlooking the Bay. Free WIFI in public areas is also available for all the guests at the hotel. Le Méridien in Malta caters for your needs in a personalized fashion and its features stimulate creative minds: international cuisine, wines of the world, coffee culture, partnerships with local artists and cultural ambassadors. The hotel is an ideal place for meeting planners with its AIM Center (Arts, Incentive and Meetings) dedicated to business events. Twenty minutes from Malta International Airport, the Hilton Malta hotel is located in the fashionable St. Julian’s area. Decorated in the Mediterranean contemporary style, the spacious rooms offer the option of balconies and stunning Yacht Marina or sea views. Choose from several dining options, including two year-round restaurants, one summer-only restaurant and four bars showcasing a variety of flavours from around the world. Savour Mediterranean tastes from fresh local ingredients at the Oceana restaurant. Try authentic Thai cuisine in tranquil surroundings with waterfalls and lush greenery at the Blue Elephant Restaurant. Discover fresh flavours at the Merkanti Bistro. Relax with a cocktail in the nautical Quarterdeck Bar. The hotel’s LivingWell Health Club boasts quality weight machines and cardio equipment. Swim in the 20-meter heated indoor pool, unwind in the sauna or steam room, and treat yourself at the Myoka Five Senses Spa for unique treatments. This Maltese hotel can be the perfect location for your dream wedding, birthday party, or anniversary celebration. Choose a romantic setting overlooking the gorgeous Portomaso Yacht Marina, or exchange your vows in full view of the deep azure of the Mediterranean Sea. Enjoy endless leisure facilities and one of the largest conference centres on the Island featuring an extensive range of meeting rooms ideal for any corporate events from 2 to over 1,300 delegates. 5 star luxury in Malta’s historic Art Deco hotel. Located at the City Gates of Valletta with its magical secret garden, Hotel Phoenicia is perfectly placed for discovering the historic walled city, feasting on Caravaggio’s paintings and exploring the magnificent Grand Harbour. With award-winning service and excellent facilities, the luxurious Hotel Phoenicia is a sumptuous retreat for the discerning business traveller – and a luxurious indulgence if you want to spoil yourself or a loved one. Original features mingle with distinctly modern twists, refining the effortless Art Deco elegance that makes Malta’s finest hotel so special. A stay at the Hotel Phoenicia is an unforgettable experience. Our charming staff will ensure your every whim is catered for. A perfect island getaway, the Radisson Blu Resort, St. Julian’s is surrounded by views of the Mediterranean Sea. 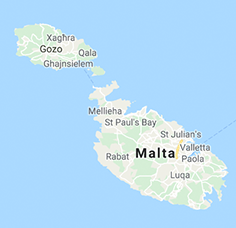 Conveniently located in St. Julian’s, the resort is only 13.5km from Malta International Airport and under 10km from Valletta, the Maltese capital. Each of the 252 stylish rooms and suites includes a balcony or terrace where you can admire the lovely vistas. Some rooms offer a view stretching as far as Malta's sister Island, Gozo. The 4 restaurants and bars at the Radisson Blu St. Julian's Hotel offer a diverse experience. Indulge in Mediterranean dishes at Le Bistro, or enjoy themed dining with varied buffets at Kon Tiki. At the Edge Restaurant, you can choose prime cuts of meat and fresh fish from the display, then watch our master grillers cook your selection. Sip cocktails on the terrace at The Bridge Bar as you take in the sea view. In addition to a gym, 2 outdoor pool decks, an indoor pool and 2 tennis courts, the resort is home to a boutique spa and wellness center. You can explore the clear sea and learn to dive like a pro with classes from the resort’s diving school. If you’re traveling for business, the flexible meeting spaces are ideal. The 5 meeting rooms can host a total of 1,500 guests, and the spacious indoor-outdoor facility makes a perfect venue for weddings, family functions and catered events.